ATHENS, Oct 9 2018 - From 1 July through 5 October IOM, the UN Migration Agency, provided safe accommodation to 2,272 vulnerable migrants and refugees who were transferred from the North-eastern Aegean islands to mainland facilities by the Greek government. Some 889 children, 393 girls and 496 boys were among those relocated from the islands in efforts to ease the strain on island capacity and hardship for these groups. The Greek government started the process of decongesting the islands in July and transfers reached a peak in August 2018 according to IOM Greece press officer Christine Nikolaidou. She also explained these movements are expected to continue in the coming weeks. The majority of these vulnerable migrants and refugees – 875 individuals – are currently housed at the Volvi open accommodation site in Northern Greece. A further 555 have been transferred to the Vagiochori open accommodation site, 229 went to Malakasa and 221 are at the Oinofyta site. 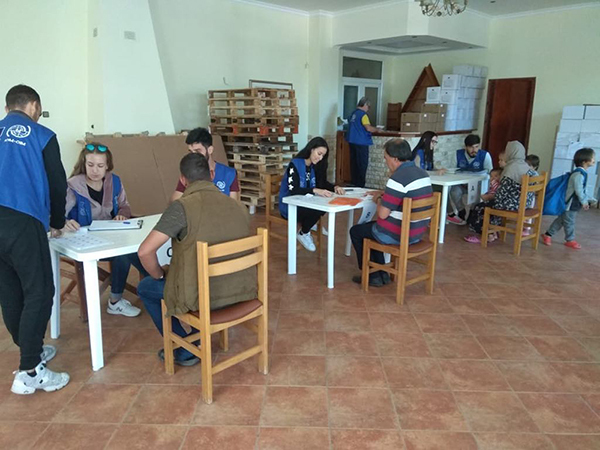 The migrants and refugees have been relocated mainly from the islands of Lesvos, Samos and Chios to 12 open accommodation facilities, where IOM is the official Site Management Support (SMS) agency. At all sites, IOM works with facility coordinators, interpreters, legal advisors, community support workers, psychologists, handymen and engineers to ensure safe and functional accommodation conditions and facilities. Pregnant women, single parents, unaccompanied minors, individuals with physical and mental traumas and families with underage children currently have priority under the islands’ decongestion programme. The vulnerability of each case must be certified by Greek authorities. In most cases beneficiaries are awaiting a formal decision on their asylum applications.